What else is new? A dose of mumblings! receive a response, don't think I'm ignoring you! I appreciate hearing from you so much!! Alas I seem to have no pictures of my work available to show you today. It's been one of those weeks where I was being 'social' and there was precious little in the way of creativity happening. I can, however, lead you to what I'm working on in the evenings. If you go HERE and scroll down to the bottom and notice the blue and white sweater on the right you'll see. Mine will be somewhat different and I will be sharing a picture as soon as I get it done. Seems to me there's a wee grandson out there that just 'happens' to be a fan of Chase and so a doting grandma can't let this opportunity pass her by. A bit of a report re 'Jack's balls' - yesterday was laundry day and we gave them a test run. We used two balls per dryer load and they seem to work!! The true test will come in the winter when static is more of an issue but for now we're quite pleased. One of my blog readers (thank you!) said that she uses four at a time with good success so we'll have to keep doing test runs to see what might work best for us. Jack just might have to make some more! - There's a good article HERE about picking up stitches in knitting and part two of the article can be found HERE. - And also for the knitters, another excellent article HERE for different methods of joining yarn into your project. - There's a lovely tutorial HERE for making fabric pumpkins for your fall decor (they'd also work as pincushions!). - Some of you may find THIS post interesting - lots of amazing eye candy! - Have a look at the portfolio from THIS artist! - and how about the work of THIS artist?! - I mentioned in one of my earlier posts that there was a soon-to-start alphabet embroidery pincushion stitch-a-long and the first post is today. You can find it HERE. - Oh my goodness, how many of us would love to have one of THESE? Scroll down for the free pattern. 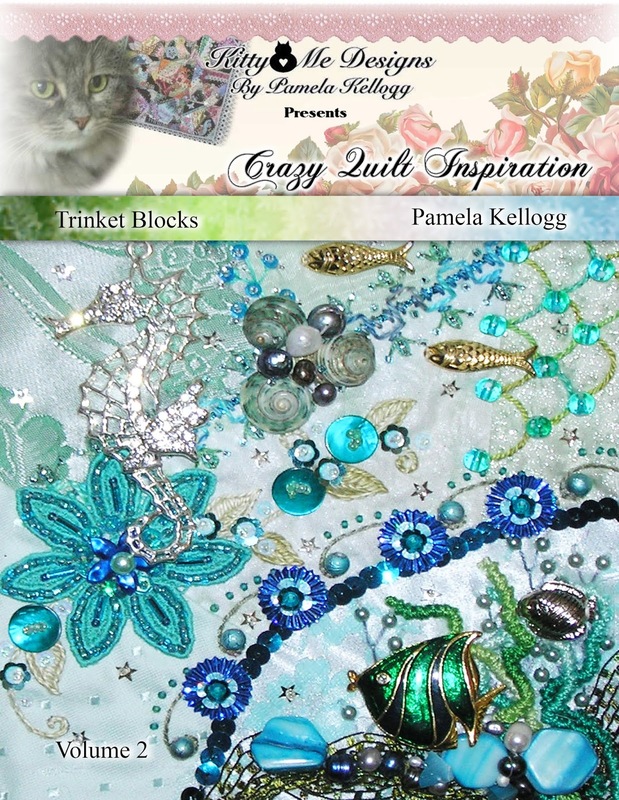 - Pam Kellogg just released another in her beautiful crazy quilt inspiration book series and you can read more about it (and purchase your own copy too!!) if you go HERE. In this book Pam features lots (and lots!) of special trinkets she has collected. You know the ones - the things that you've kept for something 'special' and that end up just residing in a box somewhere! - Perhaps you'd like some of THESE for your fall decor? - THIS is another great decorating idea if you have access to someone with woodworking skills. - And, finally, HERE is a fun way to make fibre eyes for a toy for a small child. Today's quote..."No matter how educated, talented, rich or cool you believe you are, how you treat people ultimately tells all. 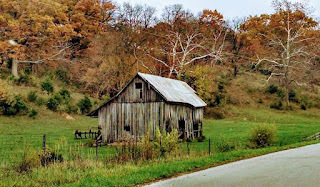 Integrity is everything"
And another one begins....another barn that is. This one is another commission and I'm rather excited about it because it's in fall colours, different from any I've done up until this point. I've been wanting to try this colour scheme so now I have a good excuse. - Have a look through the galleries of THIS amazing artist! - If you have just one ball of sock weight yarn and don't know what to do with it, perhaps some of the links found HERE might give you an idea. - THESE are strictly for inspiration but aren't they pretty? 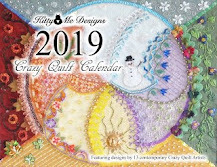 - THIS is a pretty doily pattern, and there's THIS one too. And if you'd like to make a lovely crocheted flower, how about THIS one? - Have a peek at THESE - so cute and who knew pop tabs could be used that way. - THIS is an amazing cake (that just happens to be a pincushion!! )....there's a link to the instructions via pdf file. Today's quote..."No response IS a response, and it's a powerful one"
NEVER let it be said that this blog hesitates to go where most would fear to go. Maybe this one is over the top, even for the writer here at Chez Magpie. Who knows, maybe this time it might be enough to put this blog on the 'red flag' list. So....at the risk of offending anyone's sensibilities....please be forewarned. also come in multiple colors! Get 'yer minds outta the gutter people - did you REALLY think you'd see what you thought you'd see?? Seriously? These are DRYER balls - or will be, once they've finished drying after felting. My long-suffering husband patiently rolled wool yarn into balls, boiled them and then felted them....all because we wanted to test to see if all the hype about using these in the dryer instead of dryer sheets is true. and simply HAD to share. - If you like flutter-bye's perhaps you'd like to try making one (or several!) of THESE. - If you use folk art paint (do they call it that anymore? ), perhaps you'd like to make yourself one of THESE for storing them. I would LOVE one!! - There are links HERE to a ton of Halloween projects and decorating ideas. - There's a great zippered sewing notions tote tutorial HERE. - How about THIS sweet little pincushion? - I like what THIS person did with an old suitcase. Who couldn't use one of these? Your quote..."Give, but don't allow yourself to be used. Love, but don't allow your heart to be abused. Trust, but don't be naive. Listen, but don't lose your own voice"
Yesterday I finished the latest barn project and hopefully my customer will be pleased with it. - If any of you happen to be looking for ideas for things to create for church bazaars or craft fairs, how about THESE? They'd make lovely little gifts too! - Some of you might be interested in THIS - free stitch-a-long featuring alphabets AND pincushions! - Have a peek at the amazing embroideries by THIS artist. - Sometimes the sweetest things are absolutely the simplest and you can see what I mean by scrolling down on THIS post. - HERE is another sweet little embroidery project. - And further on the sweetness theme, how about THESE? - HERE is a great use for plastic bags - just be sure to work in a well-ventilated room! Today's quote..."Happiness is a choice, not a result. Nothing will make you happy until you choose to be happy. No person will make you happy unless you decide to be happy. Your happiness will not come to you. It can only come from you"
Well folks, the lilac bush has been replanted and it's blooming profusely - much better than the more-sickly previous version!! What was the fix, you ask?? Well, I reprinted the lilacs onto fabric using a different setting on my computer and that made them brighter....a good thing. Then I judiciously fussy cut them and applied them to the quilt. I followed that up with some embroidered 'twigs/stems' and some randomly placed French knots to add a bit of dimension to the shrub. Much better!!! - Have a look at the amazing knitting done by THIS artist. - And the work by THIS artist (click through her gallery), and THIS one too (be sure to check out her various subject headings). - THIS is made using paper but there's no reason you couldn't also make it in fabric. - Although many of THESE are paid patterns, perhaps something might catch your eye. - THIS is a sweet little crocheted flower pattern that would be a fun addition to so many things. And THIS is another one. Your quote..."The strongest people are not those who show strength in front of us but those who win battles we know nothing about"
George Washington ain't got nuttin' on me!!!!!!!!!!! Yep - he chopped down cherry trees and I lob off lilacs! After doing tons (!) of French knots to highlight/create the lilacs on the bush, I decided that the foliage needed to be augmented too. So...I came up with a grande plan. You know....one of THOSE plans that are bound to go amuck....and this one did, spectacularly!!! The plan involved felting the greenery which I thought would be a good foil for the French knots. The search began for green wool and I lucked out and found a couple of balls of 'almost green' at the local department store. No problem, said I to self, I can simply water down some paint and dye it!! W-e-l-l, that sorta worked. Undaunted, I soldiered on (see that?? Another reference to good ol' George!!). I felted it down and, wonder of wonders, I only broke two felting needles and punctured my finger once. I was on a roll! Hmmm....all that felted yarn needed to be held down somehow, so how about free motioning with green thread? The roll continued (and you KNOW already that the roll was right straight downhill, don't you). I sat back and stared at it. I waited until night and stared at it some more. And, you guessed it, I HATED it. Abhorred it actually. So...undaunted (and refusing to admit defeat)....I hauled out my paint and dabbed it here and there. Sat back and stared some more. Well, suffice to say the scissors were applied and with good ol' George's approval, I just cut that lilac tree right outta there. Never let it be said that your intrepid blogger fears showing you her failures. And before you all think that you should leave a comment telling me that it looks wonderful, I know better. Remember, your momma taught you not to lie. Oh, and just so you don't think I wasted all that time and effort....I now have the base for a postcard and three atc's. Waste not, want not. - There's an interesting way to cast on for knitting using a crochet hook HERE. - Check out the links HERE for some really nice tote bags. - You would need the space for one of THESE in your sewing area but if my room was bigger, I'd happily create one. - Although THIS is originally intended for a suitcase for little girls to play with, wouldn't it be a perfect hold-all for our crafting supplies/fabrics? - THIS is a scrapbooking design, but wouldn't it translate amazingly into a quilt? Today's quote..."Maybe the journey isn't so much about becoming anything. Maybe it's about unbecoming everything that isn't really you, so you can be who you were meant to be in the first place"
The original photo had a lilac bush in the foreground and after much waffling and navel-contemplating, I suddenly had a brainwave and remembered that there's no reason I can't print my own fabric. So I scouted about the internet and found an appropriate photo and printed it onto my fabric. Then....in a fit of complete and total madness....I decided that those lilacs needed to be done in French knots. Thousands of them. Possibly even hundreds of thousands. Anyway....the barn itself is well underway and that makes me happy. If you scroll back to my previous post perhaps you can see the difference. - THIS is a very interesting article about dealing with yarn twisting while you're knitting with multiple colors. I especially love the idea in the first picture! - I love THIS idea - AND it comes along with the fun of eating the goodies first. Win/Win in my books!! - There are a bunch of links HERE for some pretty fun Halloween projects. - THIS is rather cute too, but I think I'd be tempted to stuff it for a fun little toy for kids. It caught my eye because I have a special request to make one of THESE for our #2 grandson. I might just have to make him a toy to go along with it!! - Have a look at THIS tutorial to make a beautiful large flower! Another anonymous quote..."Too often we underestimate the power of a touch, a smile, a kind word, a listening ear, an honest compliment, or the smallest act of caring, all of which have the potential to turn a life around"
Yep, today we return to your regular thrice-weekly dose of mumblings from the chalet here at Chez Magpie. Some of you might be glad about that and others might simply just say 'meh'. At any rate, behind the scenes whilst the 'Grande Look Back' was taking place, I actually have been working on something. And I'd be willing to bet you already know what!! I've been commissioned to make two and this is one of the photos my client chose for me to attempt to recreate. - I really like THIS for a tote bag! There's a link for the free PDF pattern. - There's a number of really great sizing charts HERE for both knit and crochet. 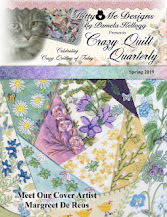 - Lots of cat and dog quilt pattern links can be found HERE. - I thought I'd slip a little Christmas idea in here, just for the fun of it. Have a look at THESE (be sure to scroll down!). - There's a nice no-nonsense alphabet cross stitch design HERE and if you go back to that site HERE and scroll down you will find lots of other fun alphabets to use in your projects. - Sometimes I stumble across a really smart (and cheap!) idea and THIS certainly is one of them. If my DH hadn't already made me a wonderful thread holder, I know I'd be making one of these! Today's quote..."Stop thinking so hard about everything. Stop over analyzing. Just go. Just do. If it feels right, just go with the flow. If it feels wrong, don't think about it any more and walk away"
Finally. Done. Finished. Over With. Kaput. And I can hear your collective sigh of relief all the way from here. The fact that you've stuck with all this backward looking and reminiscing says a lot about you. Not so sure what it says about me....and I'm not about to ask your opinion on that because I strongly suspect I might not want to know!! We will visit the final half of 2017 and then will return to the regular mindless mumblings you are accustomed to finding here at Chez Magpie. The design for these morphed from the best parts of a number of patterns so I suppose it could almost be said that they are my own. Every year I create at least twenty Christmas ornaments which then become either the 'bows' on packages or act as little gifts in themselves. My own design - each pocket is labeled with the needle size and, in theory, I should be able to find what I'm looking for. In theory. Once I picked myself up off the floor, I felt truly honoured! This is a crazy quilted valance which now graces my sewing room window. And before you go getting all excited and thinking you should be impressed by how much I get done, this one was done entirely on the machine so was f-a-s-t.
For those of you who feel the need of another of the 'Magpie Lessons' have a look at my post HERE. Don't say I didn't warn you! So, this brings us to the end of this long, boring, mind numbing retrospective (and I CAN hear you cheering you know). Unless, of course, you really would like to see some of the 'stuff' that came out of my sewing space to help good ol' St. Nick out, in which case you can have a peek at my December posts for 2017 in my sidebar. - There are no instructions for making THIS, but what a great idea (and simple enough to create on your own). I think it would make a great purse! - There are links HERE to all sorts of free flying geese quilt patterns. Some really pretty (and unusual ones). - I know I don't normally point you towards a paid pattern but sometimes something is just so outlandishly cute that I can't help it! Go HERE to see what I mean (and be sure to scroll down to the bottom to see the others she has designed). I want a dragon (or several!!). Another great anonymous quote..."You don't meet people by accident. There's always a reason...a lesson or a blessing. I waffled about doing 2017 in this look back but finally decided it would complete the set so to speak so I opted to go ahead. I promise that there's only one more post in this series and then we'll return to the regular mumblings. ...and if you visit my blog post from HERE you can see all the individual blocks. If you are interested in seeing this project develop feel free to scroll through my blog posts dating from late January until May 22nd. The words around the edge are 'I'm gonna love you, like nobody's loved you, come rain or come shine'. I also challenged myself to include a heart, a word, a rose, and a vine on each block. It measures 36" square and is for sale if anyone would like to contact me. If you want to see more check out the 'felt food' label in my sidebar. In May I also completed work on a fun challenge project that was through the San Francisco School of Needlework and Design and sponsored by Swarovski. (Sorry about the glare on the glass!). about this project, have a look at the post HERE. And in July, just for fun, I crocheted this wee little fellow who went on to live with our # 2 grandson.. The pattern is 'Donato' and is a free pattern found HERE. - For the little giraffe-lover in your life, how about THIS? - There's a cute cross stitch pattern HERE for a fall tree, along with an interesting article about how she creates her cross stitch patterns using photos. - I stumbled across THIS tutorial for making a container for holding essential oils, but I thought it would work for other applications as well. There's also THIS. - There's a short video HERE with some good information re transferring images to fabric. - Have a look at THIS! Sometimes people create the most amazing things. Another anonymous quote for you...."Most of the problems in life are because of two reasons: we act without thinking or we think without acting"
I know you have to be beyond bored with all this, but we're almost there! In this post we'll have a peek back at the last half of 2016. The pattern was a free one from Bernat and can be found HERE. The pattern came from one of the books written by Tone Finnanger. you can have a look at my post HERE. check out the label 'Quiet Book' in my sidebar. The pattern is from a Beehive booklet called 'Knit Menagerie"
- My friend Renee from the blog 'Handstitched Treasure' has created a very extensive tutorial for making wonderful crazy quilted postcards. Her final post is HERE (and if you scroll down you will find links to the rest of the parts of the tutorial). - Have a look at the collection of quilts made by THIS artist. - There are lots (LOTS!) of free quilt patterns available HERE. - Most of you know I used to love working with recycled denim, so of course THIS would catch my eye! - For those of you (not me...cough...cough) who have an over-abundance of buttons in your stash, perhaps THIS might intrigue you? - THIS is part one of a series for making a gorgeous quilt using recycled linens. There's a link at the bottom of her post to part two (and so on). - I stumbled across THIS most interesting post with a novel approach to creating buttonholes in knitting. It looks somewhat confusing as you read through but I suspect taking it step by step will make it clear. It certainly makes a really neat-looking buttonhole! Another anonymous quote today..."Note to self: I don't have to take this day all at once but rather one step, one breath and one moment at a time. I am only one person. Things will get done when they get done"
Never let it be said that here at Chez Magpie there is ever a lack of eyebrow-raising and disbelief. The latest on that front is that the Mrs. has reverted to childhood. Yes, people, she parted with the princely sum of $1.64 (plus tax) for the giant economy sized box of 64 Crayola crayons. Can drooling and bibs be far behind? If you'd like to read more (and see more pictures) have a look at the post HERE. If you would like to see ALL the pillow covers in one place, have a look at the post found HERE. The pattern is called the 'Building Blocks Throw' and is free HERE. Also in May and also for our oldest grandson, grandma created a pirate costume for him to wear at his birthday party. And, just to add a little humour to this post, HERE is another of my 'sillies' that I wrote about. At the end of June in 2016 I began what would prove to be a long series of seam treatment designs that I insisted on sharing with you (whether you were interested or not!!). You can get access to them all simply by clicking on 'seam treatments' in my sidebar. All free - all the time!! - If you are interested in miniatures - and paper - have a look at THIS amazing creation! - If you have orphan quilt blocks and don't know what to do with them, how about making them into pincushions as you can see in this post HERE. You'll have to scroll down a wee bit to see it. - There's a nice pattern HERE for making a quilted accordion pouch. - And a nice stained glass tote bag pattern HERE. Another anonymous quote..."One of the hardest lessons in life is letting go. Whether it's guilt, anger, love, loss or betrayal. Change is never easy. We fight to hold on and we fight to let go"
Continuing on with the little series of peeking back at some of the things I've done, we're now ready to re-visit the rest of 2015. 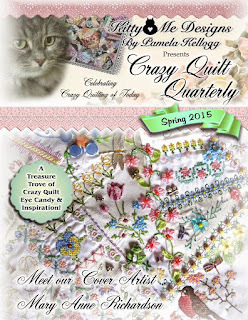 In the spring of 2015 I was honored to be asked to become the Assistant Editor and proofreader for Pam Kellog's new 'Crazy Quilt Quarterly' magazine. 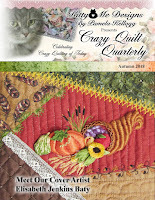 Since then much of what I have created in crazy quilt has been for publication there. Not only that, but my work graced the very first cover! 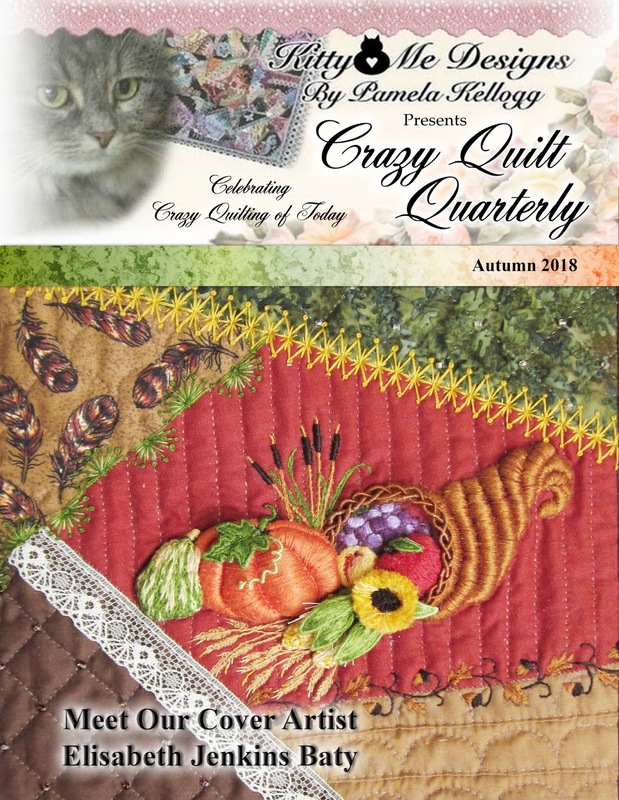 Also in 2015, Kathy Seaman Shaw asked me to proofread her series of crazy quilting books and she subsequently has published two volumes: 'Beyond the Basics' (2015) and 'Ribbon Embellishments' (2016). It was a huge honor to be asked to help her with these projects. Both books can be found on Amazon HERE and HERE. The pattern for the cake came from HERE, the whipped cream from HERE and the strawberry from HERE. These diaries covered the daily life in a farming community from the years 1869 through 1943. - For those of us here in Canada that might be searching for online sources for fabric, have a look at the comprehensive list found HERE. - Sometimes something pops up on the internet that astounds me. It's even better when it not only astounds me, but also makes me laugh. If I still had a garden, and had the raw materials, I would SO be making one (or several!) of THESE!!! - And, just to further the fact that this blog is totally eclectic (!) I came across a couple of computer printer hints I thought I'd pass along. One is to use the 'Century Gothic' font for your documents you plan to print...seemingly it uses less ink. The other hint was to shake your ink cartridge when you are being prompted to replace it - often it will give you quite a bit more printing time. Who knew? (See? I TOLD you this blog was eclectic!!!). - For those of you who like doing zentangles, perhaps you'd like to give it a try with fabric using the tutorial HERE. You could also use any colours of fabric I think. Another quote from an unknown person..."Stop thinking so hard about everything. Stop over-analyzing. Just go. Just do. If it feels right, just go with the flow. If it feels wrong, don't think about it anymore and walk away"
Today our look back will include 2014 and a little bit from 2015 (are you bored yet?????). going to my post HERE and HERE. Pattern was found on Ravelry - "Rose Doily #804"
Also in October I completed a commission for one of my crazy quilted purses. The pattern is "The Gadabout' and is by Studio Kat Designs. You may see more pictures and read more about it HERE and HERE. be reminded of it by reading my post from March found HERE. - HERE's a great little stash buster that any stitcher would love to receive as a gift. - The fall issue of 'Crazy Quilt Quarterly' is now available! I must admit to being rather happy because there are several of my things in there....one of my barns and a tutorial for the denim and lace bag that you've seen previously on my blog. Be sure to pick up your copy by going to MagCloud HERE or Etsy HERE. - If you have a little girl in your life who loves the Disney princesses, perhaps you'd like to make her one (or several!) of THESE! - That same little girl might just adore one of THESE simple to make dresses. Another of the anonymous quotes from my collection..."If you have a family that loves you, a few good friends, food on your table and a roof over your head, you are richer than you think"